Tecmark kept up the tradition and worked at the Entrepreneurs House on July 29, 2013. 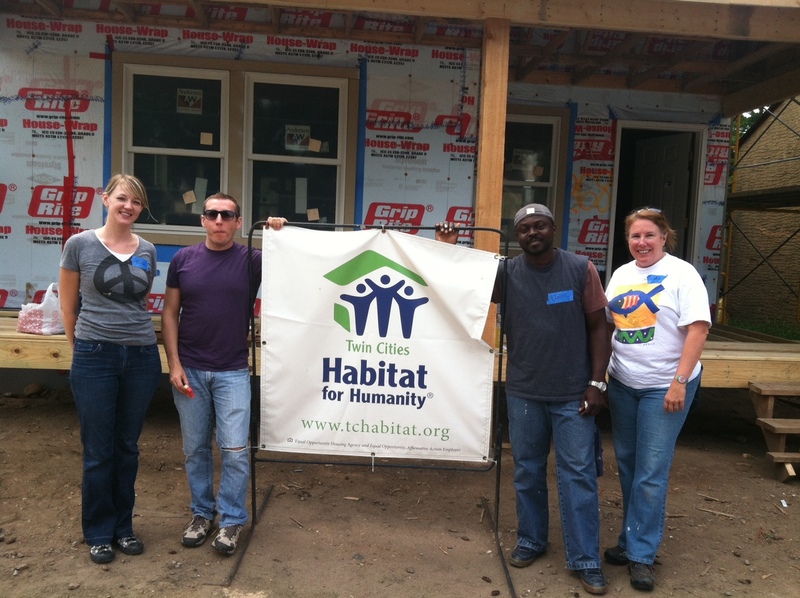 This is the 11th year that we have participated in building a Habitat for Humanity house. As stated in my earlier blog, the Entrepreneurs house gives companies that are smaller a chance to team up to build a house. We had the perfect day – sunny and in the 70s. We worked with a group from McGladrey, an accounting firm. Our task was to paint the exterior of the house. We were able to do 2 coats on the house and one coat on the garage by the time our day was done. The part I love about Habitat is that any skill level is welcome and they will always find a job that can be done. The site supervisors were great. The family that is going to live there is a single mom with 14 kids and 3 grandkids. The 4 youngest children ages 8 – 16 will live in the house and her grandkids ages 2 – 7 will also live with her. She arrived in the US from Somalia in 1999. The house has 5 bedrooms and 2 bathrooms. Since 1976 over 600,000 houses for more than 3 million people have been built in 90 countries all around the world. A new Habitat house is completed somewhere in the world every 21 minutes. In 2012 Habitat served 94,618 families. $76 million are the net profits generated by more than 750 Habitat for Humanity ReStores in the US. Those funds are used for Habitat houses. The ReStores diverted 200,000 tons of building materials from landfills, while employing 2,250 people. Habitat is the 6th largest home builder in the US and the largest private home builder according to Builder magazine. Tecmark is committed to helping the community and is proud to be part of the long history with the Entrepreneurs House!